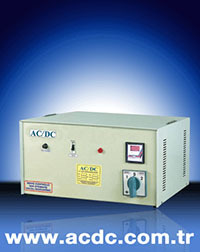 AC/DC Servo Voltage Regulators ; 1 kVA Single Phase - 50 kVA Single Phase & 3 kVA Three Phase - 1000 kVA Three Phase power range. 150 VAC - 250 VAC input voltage range, produced as standart. They could be especially manufactured up to 1000 kVA Power and between 90 VAC - 280 VAC input voltage, We offer 2-3 years of warranty. Servo Voltage Regulators determine automatically the change in voltage as the constant voltage ... This can be done by using electromechanic, passive or active components.. Servo Voltage Regulators makes the comparison amongst real output voltage and the inner reference voltages. Regulating elements make use of several elevators for the control. Negative feedback servo control loop is formed. If the output voltage is too low the control element commands the high voltage production. And conversely if the input voltage is high, it keeps the output voltage as constant... Electromagnetic regulators are being used in AC power distribution. MERT K?L?T SANAY? LTD. STI. ÇA?RI ELEKTR?K PROJE TAAH.SAN.T?C. A.?. GEA KL?MA SANAY? VE T?C. A.?.